I was supposed to go out and pick up some groceries after lunch, but I ended up watching a horror flick on sci fi channel. It was one of those badly made horror movies, but you've just got to see how it ends. After the disappointing ending, I fell asleep on the futon and woke up at 4 PM. Yes, I was surprised myself. I guess I really needed that nap. Anyway, my Valentine's Day was quiet and restful. I managed to cook some pork sinigang. This dish always comforts me especially in the winter. The highlight of my day wasn't the food or the horror flick, but these tickets. wits, I'm so excited and it's still a month away. I'll try to post reviews. I hope you enjoy the opera. I thought it was timely for the start of the spring. Happy day Kayni! Pork Sinigang! There was a time when my little brother and I lived on Pork Sinigang for 1 month. The hot and sour broth never fail to bring joy to us. Share your Opera experience ha! The only time I got a Puccini experience was when I ate at a fancy Italian restaurant called Puccini. Hehe. Sheng, Have a happy day too. Dyosa, I know, and it's so easy to cook. This is one recipe I can make anytime. Yes, I will share my experience at the opera. Ms Firefly, Hopefully, I can do a good review on both opera, as it's so different from movies and musicals. Mordsith, I think I'm more excited with Turandot because I expect more lavish costumes and the set will be made to really look like royalty. 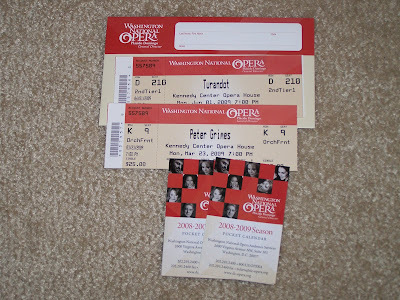 i wish i could watch an opera soon (e.g., marriage of figaro, merry wives of windsor). i can't stand too much of the weepy stuffy though... well, maybe i can sit through Wanger's Ring of the Nibelung heheh. whatever. yummy. i love pork sinigang :) especially if i see tidbits of fat floating too :) hahah, typical pinoy ba..the fattier the better..
Peter Grimes look interesting,might be nice to see it here too. will check what they are having in the Opera House. good idea. Three suitors have to solve a riddle or they die? How about she just reject the ones she doesn't like and let them live? Sounds like a better option, I think. hehe. I've never been to an opera. It's in Italian, right? Onyxx, I could actually stand the weepy stuff as long as it's being sang =). Toni, I always find opera a good way to unwind and get away from my usual life. I hope they'll be playing Peter Grimes there too. Wil, I agree, she can just tell who she likes and reject the others, but then, there'll be no interesting story of Turandot. Yes, it's in Italian, but there are supertitles.